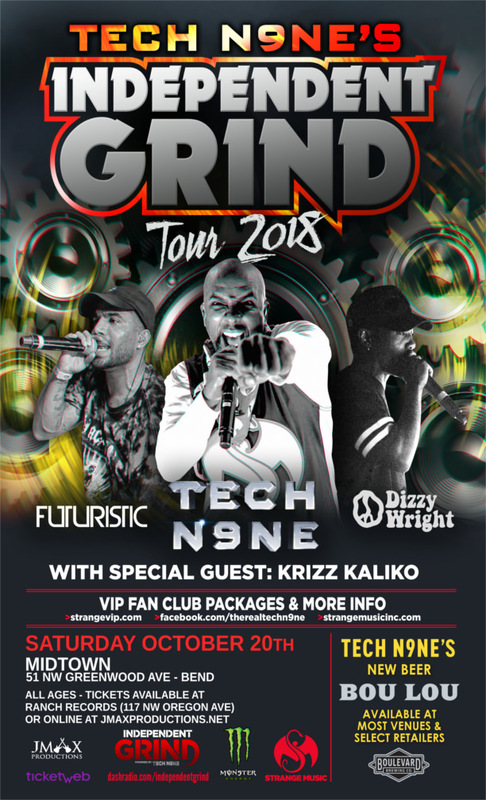 Strange Music is pleased to announce Tech N9ne’s Independent Grind Tour 2018 with Tech N9ne, Krizz Kaliko, Futuristic and Dizzy Wright. To make this tour extra special, for the first and only time ever, we’re offering a VIP package with over $500 in merchandise to go along with the artist Meet & Greet and a ticket to the show of your choice. This package also includes 4 VIP package exclusive Bou Lou merchandise items! Don’t let the chance to experience Tech’s Independent Grind Tour like a VIP pass you by. Keep in mind, there’s a limited number of VIP packages per show – so don’t wait to get yours! Head over to strangevip.com for more information and to select the show you want to attend – you’ll get an amazing package of VIP merchandise and an artist Meet & Greet. Click here and experience Tech N9ne’s Independent Grind Tour 2018 in VIP style!